Would You Dare Swim in The Devil’s Swimming Pool? When planning a vacation to get “away from it all,” most families opt for extravagant resorts, theme parks, or even camping trips. And then there are those who live for extreme sports and decide that the best way to spend a vacation would be to throw themselves into a pool of water that puts them mere inches away from the largest sheet of falling water on the earth. 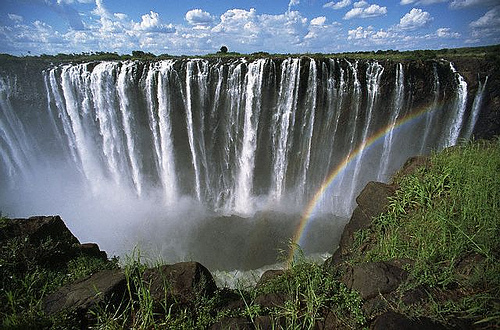 Victoria Falls is located on the Zambezi River on the border of Zambia and Zimbabwe. Its actual name is “Mosi-oa-Tunya,” which translates to “The Smoke that Thunders.” This place is as extreme as it gets and offers you the heart-pounding thrill of a free fall, with just the thought of the fall being thrilling enough. It’s extreme, terrifying, and absolutely insane; you will not soon forget your time in the devils swimming pool. While Victoria Falls is not the tallest or the widest waterfall in the world, it is still the largest. For those who have made extreme sports a way of life, the 5600 foot wide and 354 foot tall sheet of water should be able to quell your thirst for adrenaline for a long time. An amazing thing about Victoria Falls and the devils swimming pool is that they lie on nothing but flat plateau. Generally when you see a water fall, there are mountains or valleys; but not here. From September to December each year, the water near the edge of the falls decreases and is safe for extreme sports lovers the world over to take a swim in. The only access to the pool is from Livingstone Island in Zambia, and every year people flood in to take a swim in the devils swimming pool. It was originally discovered and named by David Livingston, for whom the island is named. Livingston Island is the only land accessible to the falls, which has significantly increased the number of tourists coming into Zambia. The cost of a hotel to stay in during your trip to the devils swimming pool? Up to $600.00 per night. The extreme sports experience of actually swimming in the devils swimming pool? Priceless. With the water level being low, you can swim in the pool all the way up to the very edge of the falls without falling over. A natural rock wall has formed right below the water, and even with the swift current, it keeps you from going over. Don’t be fooled though; whether or not the current carries you right over the edge of the devils swimming pool, you are still right on the edge of an enormous, roaring sheet of water. If you really want to prove yourself as an extreme sports junkie, you can slide on your stomach right up to the edge and have a look straight down. You will be deafened by the sound of the water, blinded by the brilliant rainbow of colors that the falls create, your face will be sprayed with water splashing off the falls, and your heart will be pounding at the mere thought of what just a few more inches could mean. 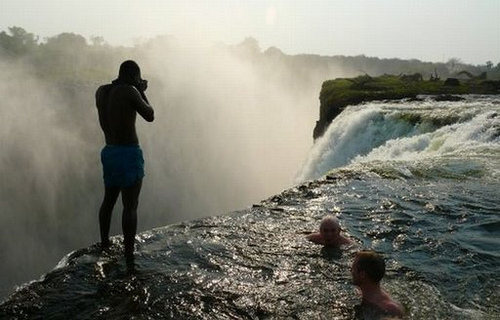 This entry was posted in Africa, Bizarre, Travel, Water Sports and tagged Devils Swimming Pool, Zambia. Bookmark the permalink.